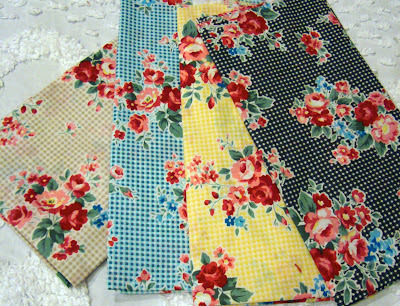 I'm pulling fabrics to use for either more of my GaGa eyes or for my new project, Farmer's Wife. You know I had to eventually jump on the bandwagon for Farmer's Wife. 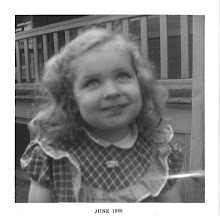 As PKM would say "all the cool girls are doing it!". I'm not going to make the mistake I made with the Dear Jane quilt - choosing fabric I don't relate to. My Farmer's Wife will be all Nanette for all blocks with a bit of the farmer thrown in. I love to collect pieces in all the color options available, when I find a print I like. 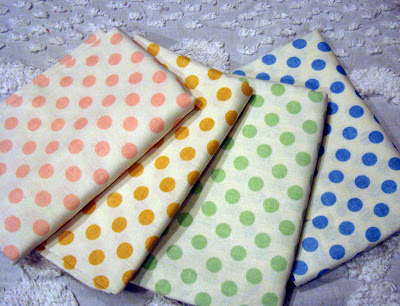 I love dots and I was really drawn to the colors, the scale of dots and the loose weave, almost feedsack quality of this fabric. Isn't that gold dot great? Well, they all are. I wish I had the above fabric in yards and yards. It is so pretty in all the colors and the roses are just so 'me'. I totally love the flower-on-check design. 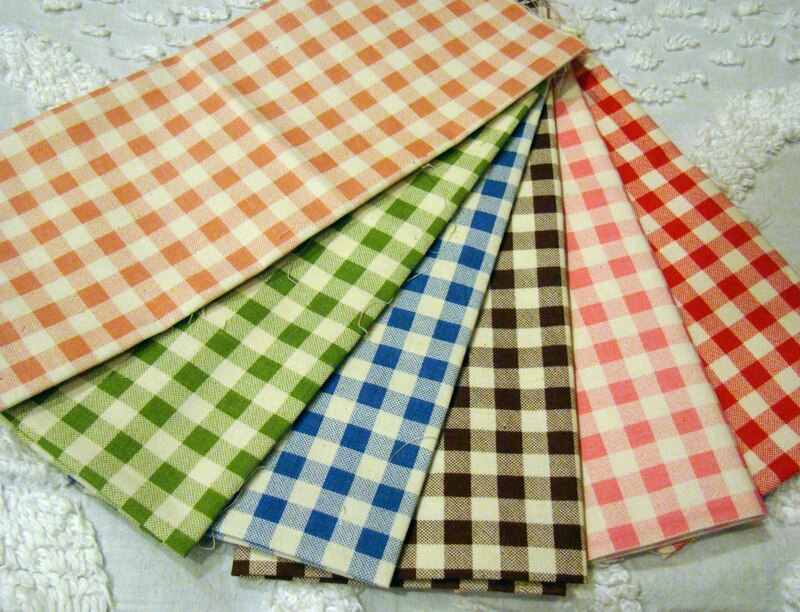 I'm always pulled towards gingham. 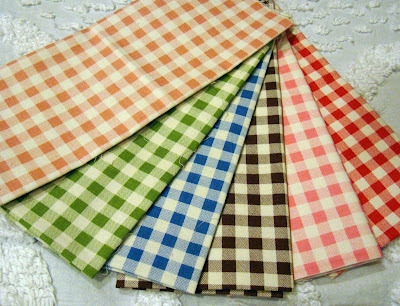 Sometimes gingham is slick, or has polyester or has a sheen to it I don't like. This is quilt weight gingham with a tiny bit of feedsack thrown in. The colors are really perfect, too. I'm not exactly sure what project all these will be used in but they will not be sitting on the shelf for long. I acquired them through China and if I could get larger yardage pieces in them, I would. I'll be happy with just a taste of each color for now. Speaking of color and things I love...Check out the A-Two website of Atskuko Matsuyama. I go pretend shopping there and I would real shop there if I could speak Japanese. I want to jump into the website and get some of everything. In particular, I fell in love with the Rainbow Macaroons. They look kind of hard to make but I'd love to try. I looked on Etsy to see if there were any ready made for sale. No dice. If anyone knows of a pattern to make a zipper macaroon, please let me know. What a pretty showcase of fabric this morning Nanette!! I can't wait to see your fabric in the Farmer's Wife Sampler. Yeah I pretend shop on A-two as well. Who's fabric is the center piece with the flowers? Darling. If I find Atsuko fabric out there I'll let you know. You know, if we can actually order it. 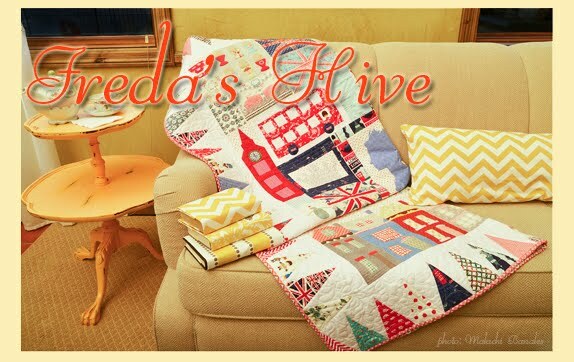 Love these fabrics and I enjoyed the links that you shared :-). Dang it Nanette -- you were my last hold-out partner -- now I'm flapping in the wind all by myself LOL! Now you've gone and done it too. 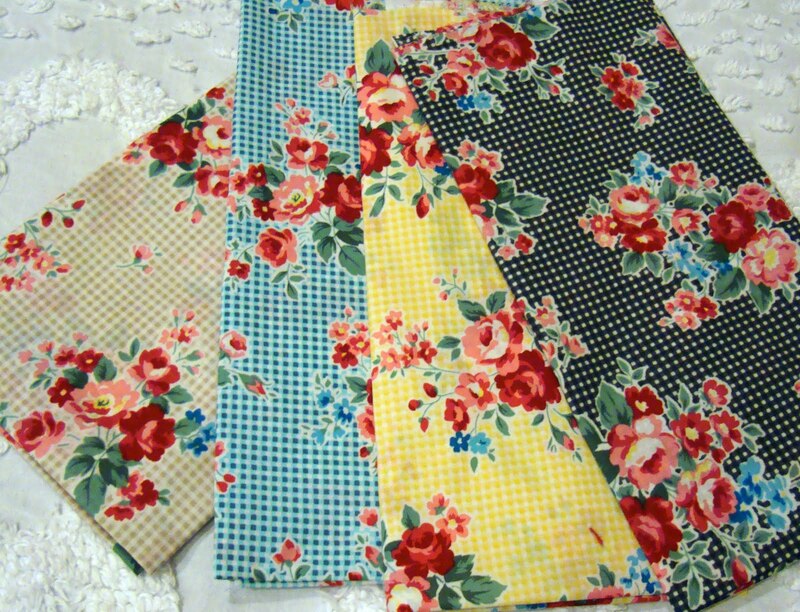 I predict we'll see a bunch of roses on check fabrics before you can even say it. 'Cause they red it here first!!! Oh boy, I can''t wait to see your farmers wife blocks, with some of those fabrics, the blocks would be so fun. Eeek on the rainbow macarons! It appears that the plastic discs are from self covered buttons. Very cute indeed. I just can't wait to see your farmer's wife blocks...just wish I could see them in person! It's just not nearly as much fun to sew fabric that you don't really love, is it? I do love those dots. I need some. In lots of colors. Oh, my. LOVE your fabrics!!! Off to check out your links. Those ginghams are so cute! They remind me of Gertrude Hawk chocolate bars!